For a long time Booksa was one of the very few places I really enjoyed going to for coffee, because it used to be one of the few cosy and smoke-free places in town. Times are changing, and in recent years lot of new cafes with a “living room” feeling opened, and even the rights of non-smokers started to become recognized by an increasing number of cafes, but Booksa is really “an institution”, a very relaxed and unpretentious place with a diverse cultural program. Officially, it’s a book club led by the cultural association called Kulturtreger, organizing literary evenings, conversations with authors, promotions of books etc., but you can also stumble upon an acoustic concert (one of Booksa’s programs is promoting young singer-songwriters, usually on Thursdays) or a travelogue lecture – anyone can propose to hold a presentation about their trip, and these presentations are usually very popular — every corner of Booksa gets crammed with curious listeners. The name of the place is a pun – the “book” part is obvious, while “buksa” means prison in Croatian slang. The bar serves both warm and cold drinks and usually they also offer some interesting homemade drink – in summer it could be a natural juice, and in winter a tea. 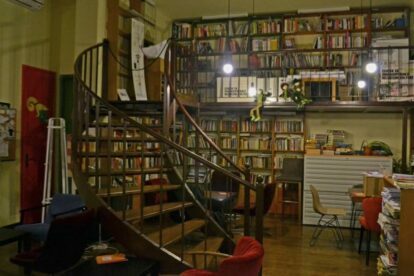 It’s a place where you can come alone and enjoy a diverse selection of books, literary magazines and various cultural newspapers (some are in foreign languages). Here you can also find useful brochures about Zagreb and its cultural events.